Rohingya migrant women, who recently arrived in Indonesia by boat, are seen inside a temporary compound for refugees in Aceh Timur regency, Indonesia's Aceh Province, May 21, 2015. Southeast Asian nations agreed to intensify search-and-rescue efforts for thousands of migrants adrift at sea, but a statement released at the end of a regional meeting failed to mention the Rohingya minority, whose members fleeing Myanmar constitute the majority of the migrants. Countries affected by the crisis agreed Friday at a one-day meeting in Bangkok to set up an anti-trafficking task force, and they also made a commitment to address the "root causes" of the migration, including improving living conditions of those fleeing. However, the agreement was carefully worded to avoid upsetting Myanmar, also known as Burma. Myanmar refuses to recognize the Muslim Rohingyas as an official minority and denies most of them citizenship, saying they are foreigners from Bangladesh. Also Friday, Myanmar said its navy seized a vessel off its coast with more than 700 migrants aboard. It identified the migrants as "Bengalis" — a reference to Bangladesh. The seizure came about a week after Myanmar found a similar vessel that it said carried around 200 Bangladeshi migrants. Following Friday's meeting, the United States said it expected to begin surveillance flights in Thai airspace to help search for boat people stranded in Southeast Asian seas. U.S. Assistant Secretary of State Anne Richard told reporters in Bangkok that the thousands of migrants adrift in Southeast Asian waters needed quick assistance. "We have to save lives urgently," she said. "We have to develop better ways of discussing and meeting on these issues and taking action when people are setting to sea in the boats, and we need to go and look at the root causes of why people feel they have no alternative but to flee their own countries and take such a dangerous, dangerous trip." While the Rohingya mostly are looking to escape discriminatory treatment by Myanmar's Buddhist majority, most of the Bangladeshi migrants are seeking to escape poverty in their homeland, primarily targeting jobs in in Muslim Malaysia and Indonesia. Representatives of some 17 countries at Friday's conference were told that more than 4,000 migrants have landed in Indonesia, Malaysia, Thailand, Bangladesh and Myanmar since Thailand launched a crackdown on human trafficking gangs this month. About 2,000 are believed to be still adrift. 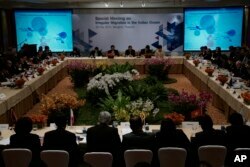 Representatives meet at the "Special Meeting on Irregular Migration in the Indian Ocean" regarding the Rohingya and Bangladeshi migrant crisis at a hotel in Bangkok, Thailand, Friday, May 29, 2015. Patimapragorn urged all countries and groups, "first, to address the immediate humanitarian situation of stranded migrants; second, to combat the long-term problem of people smuggling and human trafficking to prevent further irregular movements; third, to address the root causes from origin." Thai officials later said Myanmar had agreed to the meeting’s concluding statement, which included a sentence saying countries agreed to promote full respect for human rights and invest in economic development. But the issue of Myanmar’s ethnic Rohingya was a contentious issue during the day. Volker Turk, assistant commissioner for the U.N. High Commissioner for Refugees, said Myanmar needed to address "root causes" of the crisis, especially the issue of Rohingya citizenship. “Among other things, this will require the full assumption of responsibility by Myanmar to all its people. Granting citizenship is the ultimate goal," he said, adding that Myanmar must allow Muslim Rohingyas access to identity documentation and the ability to lead normal lives in their own country. Myanmar Foreign Minister Htin Linn countered the remarks, claiming Yangon’s sovereign right to deal with internal challenges. Bangladesh was represented at the meeting by Foreign Secretary Shahidul Haque, who said more cooperation was forthcoming. "With Myanmar, we have initiated a process for setting up a border liaison office," Haque said. "We have also proposed a [memorandum of understanding] on security cooperation and dialogue with Myanmar that includes trafficking in persons, drugs and arms smuggling." Thai Foreign Minister Thanasak sought to play down tensions, saying the aim is to avoid pressuring Myanmar on its own policies that would undermine progress in dealing with the crisis. William Lacy Swing, director of the International Organization of Migration, said the most urgent action needed was to bring boat people stranded at sea to dry land. He said he had hoped the meeting would lead to concrete steps. Rights groups say binding agreements are urgently needed to save people, and that it is crucial for Myanmar officials to make efforts to end repressive policies that force Rohingya to risk their lives with human traffickers. Activists say as many as 100,000 Muslim Rohingya and Bangladeshi nationals have taken to the seas in boats since 2012. The sharp increase in boat people came in the wake of sectarian violence between Muslims and majority Buddhists, with many deaths and 140,000 displaced and forced to live in refugee camps. On Thursday, the Dalai Lama urged fellow Nobel Peace Prize laureate Aung San Suu Kyi to speak up for her country's persecuted Rohingya minority in an interview with The Australian. Ron Corben contributed reporting from Bangkok. Portions of this report are from Reuters.